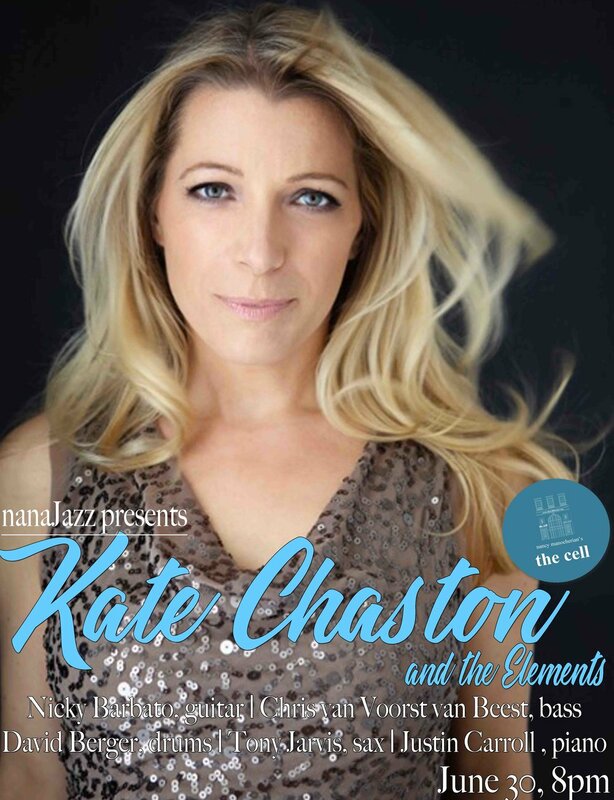 Kate Chaston and the Elements Back by Popular Demand! With a musician’s keen ear, a knack for storytelling, and rich vocals, New York-based singer/songwriter Kate Chaston and her stellar band, the Elements, engage audiences with a unique blend of cabaret- and pop-infused jazz. With a musician’s keen ear, a knack for storytelling, and rich vocals, New York-based singer/songwriter Kate Chaston and her stellar band, the Elements, engage audiences with a unique blend of cabaret- and pop-infused jazz. They say a singer is only as good as her band - so watch out, this band is hot! This night of Elements features Nicky Barbato on guitar (Paul Schafer & Omar Hakim), David Berger on drums (Justin Bond, Amy Helm), Tony Jarvis on sax (the dap kings, Charles Bradley), and more! Ever in pursuit of music, in pursuit of connection, in pursuit of authentic expression, Kate has studied and worked across musical and theatrical genres. Her career began with a Trustee Scholarship to Boston University, where she received classical training, after which she moved to NYC to study acting at the Neighborhood Playhouse School of the Theatre. Kate soon began performing at venues such as the Century Center, La Mama, the National Black Theatre of Harlem, and Don’t Tell Mama, while also performing jazz standards and covers of her first musical loves - Tom Waits, Rickie Lee Jones, Mary Chapin Carpenter. Kate began songwriting later in her career, something she calls a "surprising and deeply satisfying turn of events.” Now, whether singing her own haunting, lyrical compositions or interpreting standards, Kate can be heard in venues across the city - among them the Metropolitan Room, Metropolis and Rockwood Music Hall - with her band, the Elements, made up of a rotating cast of some of the city’s finest instrumentalists. She also partnered with grammy-nominated producers Scott Sharrard (Gregg Allman, Levon Helm) and Charlie Martinez (Steely Dan, Donald Fagen) to release a self-titled EP that showcases both her original songs and the classic covers that have delighted both jazz and cabaret enthusiasts across the city, and can be found on CD Baby, Amazon, and iTunes. o listen & learn more about Kate’s music, please visit www.katechaston.com.